Douglas E. DeGood, Angela L. Crawford, Arthur E. Jongsma Jr.
DOUGLAS E. DeGOOD, PhD, is a clinical psychologist in the Pain Management Center of the University of Virginia School of Medicine in Charlottesville, Virginia, where he is an associate professor. ANGELA L. CRAWFORD, PhD, is a clinical psychologist at the Southern Tier Pain Management Center and Southern Tier Psychological Associates in Vestal, New York. ARTHUR E. JONGSMA, Jr., PhD, is the founder and Director of Psychological Consultants, a group private practice in Grand Rapids, Michigan. 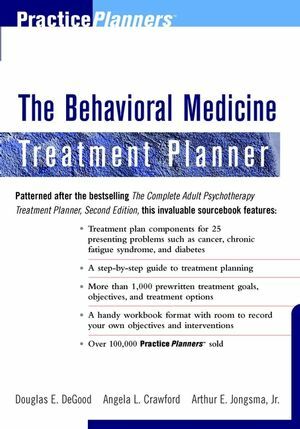 He is the coauthor of The Complete Adult Psychotherapy Treatment Planner, Second Edition.